One of the best parts of my work is mentoring people who enjoy bringing out the best in others. Kellie Smith is that kind of person. She is a Kind Dining® Instructor at Villa Crest Nursing Home and Retirement Center in Manchester, New Hampshire and recently received the Dietary Partner of the Year award for the North East region of National HealthCare Corporation. 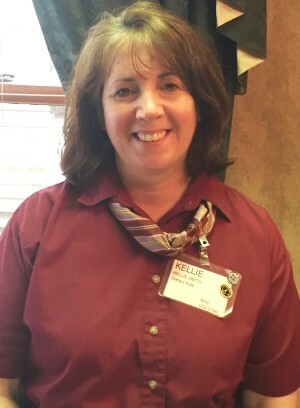 When I first met Kellie she worked as a waitress in Villa Crests’ Choices restaurant and would be training to become a Kind Dining® Instructor. I immediately saw why Administrator Sarah McEvoy and her Registered Dietitian Kathy O’Hara (both Instructors) chose to develop her leadership skills. She struck me as a compassionate, empathetic and patient person as we conversed about the dynamics of personalities and situations she experienced while serving in the dining room. She shared she stepped into this position to help make a difference in the lives of elders as a choice of employment. Little did she know she would be helping to transform lives of the staff as well to become a respected team leader. She was very humbled to be asked to take on additional leadership responsibilities, and mindful of her peers at the time. She has excelled in her new leadership position. Through training and coaching her confidence and passion to mentor and teach Kind Dining® hospitality skills to others continues to blossom. Her direct contributions with such a positive attitude and influence have improved staff behavior, and team spirit in the dining department, which delights residents and quests as they dine. Thank you Kellie for choosing to excel in your position, to coach and serve others. At Higher Standards, we believe Coaching, at its best, is the art of correction with dignity. For more information about our program email Cindy.